Seven years ago, on April 2nd, 2011, LCD Soundsystem called it a career in one of the most epic music farewells in recent memory - an expansive, five-set, four-hour-plus, Last Waltz-calibre show in Madison Square Garden that included performances of nearly every original song in their discography. Tough to come back after a grand exit like that without catching some serious backlash. But sure enough, two years ago, rumblings surfaced that LCD Soundsystem might have a lot more Michael Jordan in their DNA than Jim Brown, and by April, 2016, the band was back, headlining festivals around the world. And now, we have the new album, and I for one, am not complaining. Just like MJ, after a brief period working out the rust from their layoff, LCD Soundsystem has returned in top form - older, wiser, maybe now a step slower than those more-talented, actually really nice kids coming up from behind James Murphy worried so much about in 2002's Losing My Edge, but still the most dominant player in the dance-rock field. 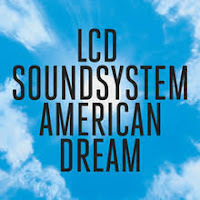 By nearly every measure, LCD Soundsystem's American Dream is the equal of, heck maybe even the superior to, the band's essential trio (quartet if you count the excellent, Nike-sponsored 45:33) of pre-hiatus releases. The songs themselves are straight-up awesome, flawlessly structured, brilliantly arranged with all manner of those skronky, Bowie/Eno/Fripper-esque sonics we've grown accustomed to in LCD's work, but with those sonics employed in a more organic, less referential manner this time out (except maybe on the blatant but killer Harry Nillson aping of emotional haircut). To top it off, James Murphy's singing has never been better. And then the mix comes into play, and screws everything up. I'm can't say what it is exactly, maybe it's just my aging ears, but something with this mix just feels off. Normally one of the most sure-eared producers in the industry, Murphy's production here just doesn't pop like on the previous releases - songs feel more chaotically and randomly balanced, vocals get buried, at times the analog synth pulses hit with an volume intensity that is almost physically painful - and the poorer quality of the mix really drops everything down a notch. Only Change Yr Mind and Tonite feel properly balanced. There's a part of me that suspects, given how precisely in control the band was in its first iteration, that this muddier, less appealing mix is fully, thematically intentional, but for me, regardless of intent, it remains an obstacle to be overcome as a listener, not a choice that adds value in an Exile On Main Street sort of way. And yet, at the end of the day, American Dream is still absolutely worthy of a Highest Recommend and my favorite album of the year. With the exception of Oh Baby - easily the weakest album opener in the LCD discography - and the title track, which are both just good, every other track on this album is fantastic. Yes, by now, the band's bag of tricks is pretty well established and several of the songs hit the same vibes as popular tracks from the other albums (Other Voices is the Us V Them/Pow Pow groover, Emotional Haircut the maximum overdrive Movement-styled freakout, Call The Police the stirring All My Friends-styled crescendoing anthem), but after a few listens that similarity in design with prior material ceases to be an issue as the new songs assert their own unique merits. Additionally, there are a few tracks here that feel entirely new, particularly the low key close out black screen with its gorgeous final three minutes, and the hyper intense, Suicide-ish character assassination of Murphy's estranged, one-time DFA partner Tim Goldsworthy How Do You Sleep?. Musically, Sleep is an amazing song, possibly the album's best track. Lyrically, the bile is almost hard to stomach. And lyrically, this is the darkest album in LCD's catalog. Obsessed with aging, diminished social relevance, destroyed beyond repair-relationships, and recently lost heros (Lou Reed, David Bowie, and Alan Vega are all alluded to here in ways both big and small), American Dream is hardly a walk in the park for listeners who choose to take on its lyrics closely, but in the end, isn't that one of rock's greatest, most timeless tricks? To get us grooving and thinking deeply about life's harder aspects in one fell swoop? I definitely thinks so, and it's one of the many reasons American Dream is McQ's top album of 2017. Cherry Picker's Best Bets: other voices, change yr mind, how do you sleep, tonite, call the police, emotional haircut. Here are the videos for the album's most heavily promoted songs tonite and call the police. While it's not my absolute favorite rock year (1967 gets that nod), 1977 may have produced the deepest batch of truly great rock albums of any year in the genre's history (with 1969, which we will revisit in 2020, seeming like the only genuine challenger)! Not only that, it was also one of the 20th century's deepest years in the guilty pleasures department - producing as many albums and songs of dubious merit that were nonetheless endearing as any year I can remember. So needless to say, there was a cornucopia's worth of material to pull from in our celebration of one of rock 'n' rolls most significant and dramatically transitional years. For those of you with an interested in how we rank 1977's albums from a 2018 perspective, click here. Otherwise, just dive in and enjoy the music on these fifteen mixes. You can access all the Spotify links from this page, or if you want more info on the artists and songs, click on mix title to get to each mixes detailed breakdown page. As we usually do, starting out with McQ's mix of his very favorite singles (and representative cuts from his very favorite albums) of 1977. And we follow that with Nancy's picks for her favorite 1977 songs. The bulk of the UK side of 1977's punk explosion gets it's due here. Followed by the Yanks, early New Wavers, and pub rockers on both sides of the Atlantic that help make 1977 arguably the greatest year in punk history. 1977, lead by by Bob Marley, Culture, The Heptones, The Congos, Peter Tosh, ubiquitous producer Lee "Scratch" Perry, and many others, was also one of classic reggae's greatest years, and much of that greatness is included here. Bowie, Iggy, Eno, Kraftwerk, Jean-Michel Jarre and a few other pioneering artists lead the way on this exploration of what was considered highly experimental in the day but now may be 1977's most enduring sonic legacy. 1977's classic roadhouse and bar band numbers, as well as a few outstanding pub rockers, all get their moment here. Oh, yeah, 1977 was disco's biggest year also. This mix compiles most of the genre's most notable hits. And part 2 takes a look at the 1977 disco's best extended length tracks. '77 metal reveals itself in all it's inane glory here. Parliament, Earth, Wind & Fire, The Commodore, The O'Jays and others show us that while disco was king in 1977, Funk was still a player on the dance floor. We conclude with a three mix celebration of 1977's less reputable classics, starting with this mix here that focuses on the year's pop, cross-over country and sappy ballad hits. Then 1977's immensely popular album-oriented rockers make their mark in Volume 13. And finally, we close out this year's themed mixes with a celebration of some of 1977's best soft-rock classics. Was your favorite song of 1977 left out? It might be on this mix here. In no particular order, here are the next 100 tunes I was considering for these 1977 mixes.